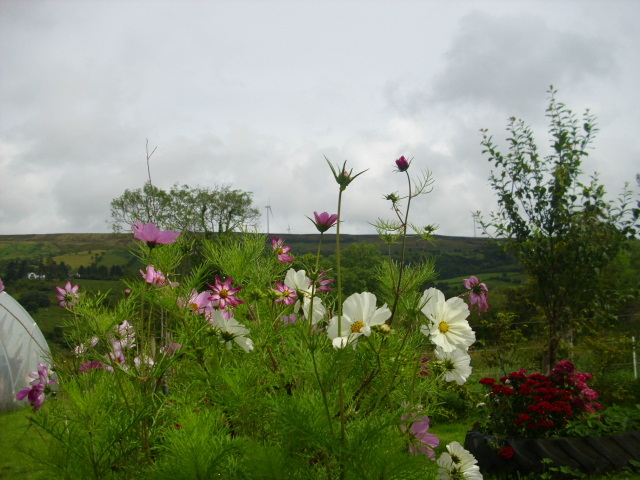 After what seems like months this week saw the welcome return of Summer to Ireland. Even though we are dependent on rain to maintain the lush greener that typifies Ireland it is nice to have Summer sunshine. July was one of the wettest and dullest since records began. But for this week at least the forecast is good…bright sunshine and dry weather all week. The Goats love this weather. They hate rain as their coats are not waterproof. If it’s raining they stay in their shed and look miserable. 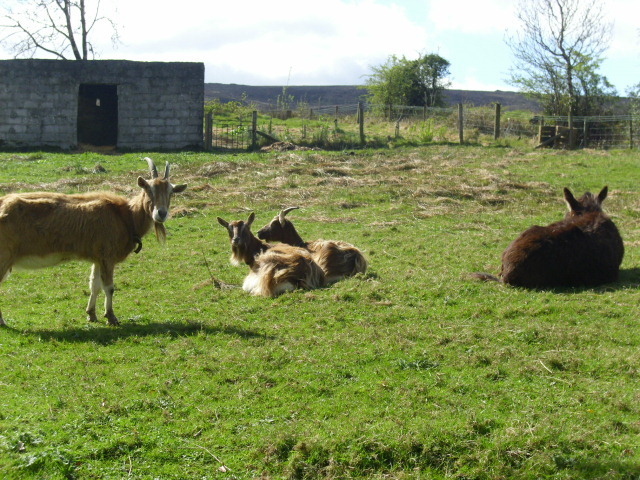 Many times I have seen Goats tied out in fields and they make for a miserable sight. I wonder how their owners would like it to be tied to a post in the rain and cold?? Today I finished picking the last of the Blackcurrants. The harvest went on for a month this year as the fruit ripened very slowly due to lack of sun. Despite that the harvest was fantastic. Actually all the berries produced a good crop this year. Not so good for Apples and Plums but one can’t have it all. Maybe berries are the way to go in our changing climate. As I harvest the Blackcurrants I prune off the branches which have fruited. This is a good way of pruning. Two jobs in one! 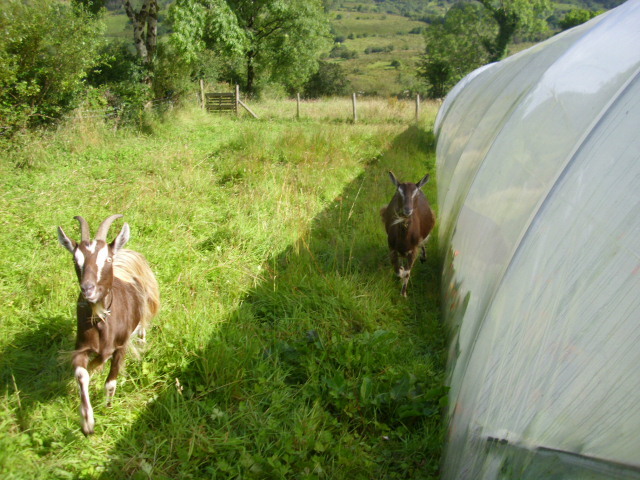 The Goats are rather partial to the prunings. I wonder if the leaves have Vitamin C like the berries? 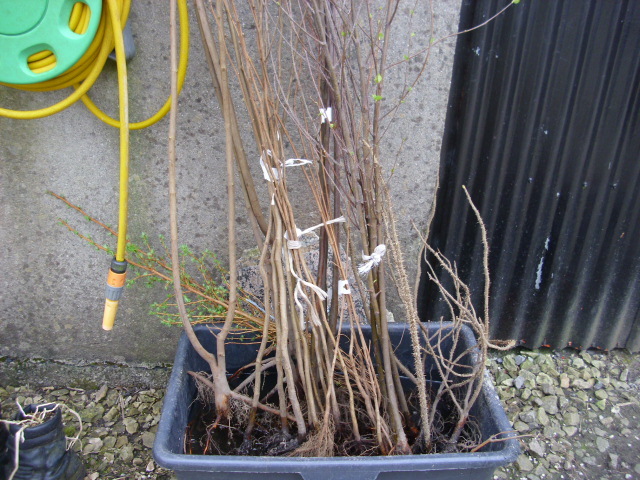 Some prunings will be used as cuttings. 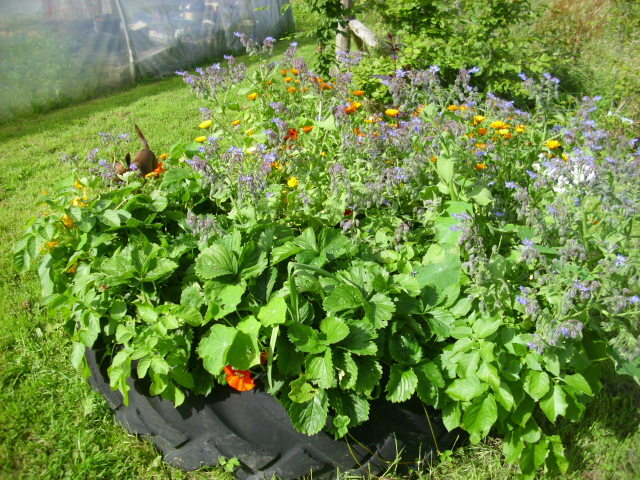 I don’t bother with putting them in a trench over Winter etc like all the gardening books will tell you. I just put them in a bucket with some water and roots form in a month or two. They are then planted in their final positions. Cuttings treated this way last year provided fruit this year. Some Willow in the water helps the rooting as Willow has fantastic rooting properties and helps other plants take root. Amazing!! The Cherry tree which was planted in this old tractor tyre sadly died, Cherries don’t do well here, so it was finally removed this Spring. 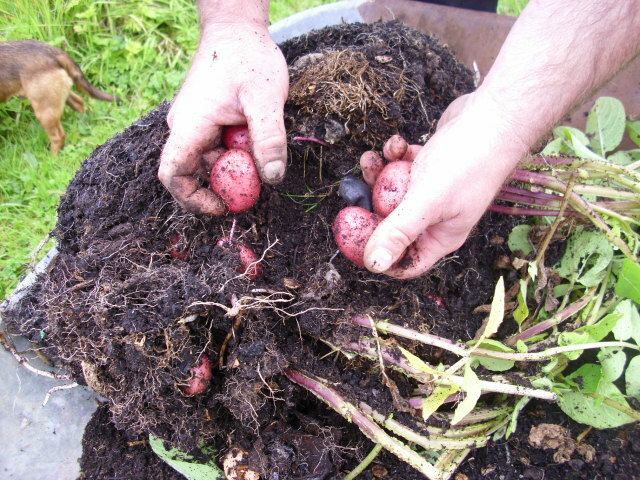 In March Potatoes were planted here and mulched with garden compost. They have done well and so has all the stuff which germinated from the compost! 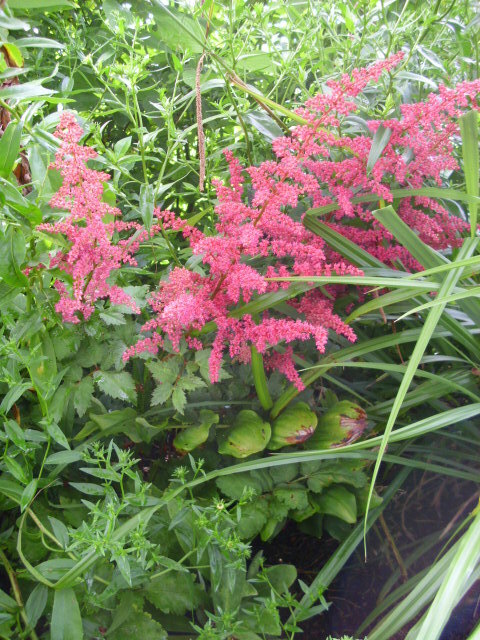 I don’t have the heart to remove self-seeded plants which sometimes works to my detriment. 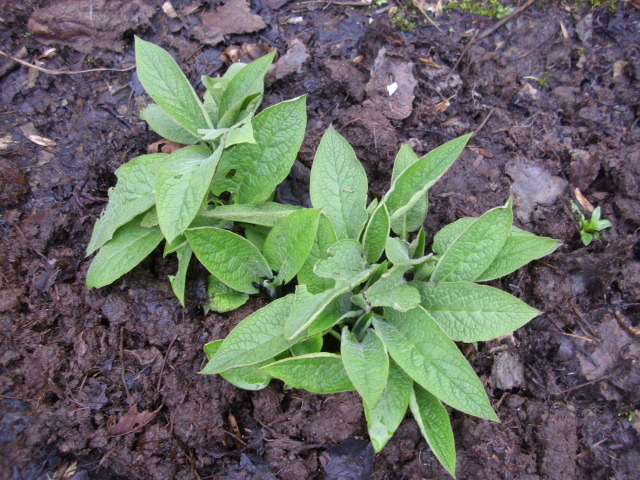 The dilemna now is how to dig out the Potatoes without losing all my lovely Borage and Marigolds? I suppose I’ll just have to wait until it all dies down. Even Strawberries which I thought were dead have reemerged and fruited. 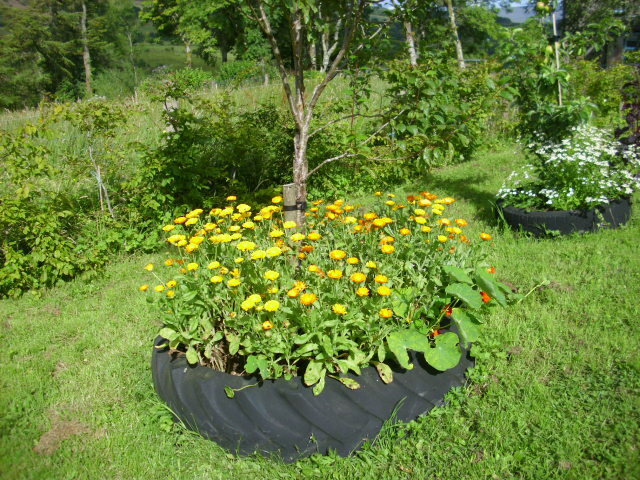 Another lot of compost used to mulch around the Damson tree has produced a wonderful crop of Marigolds. No Damsons this year though! 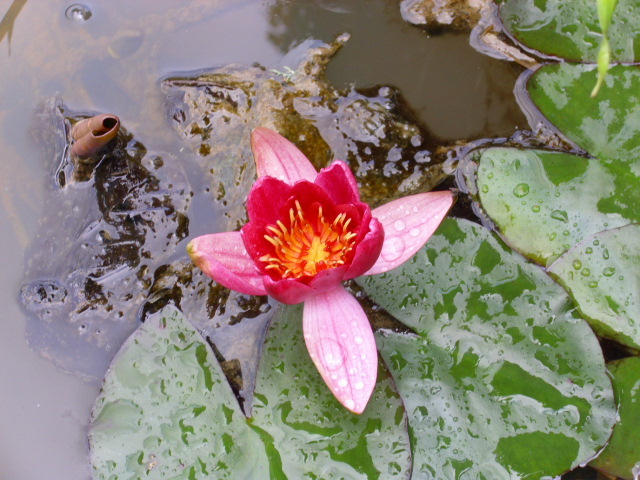 Much to my delight the Water Lily planted in the pond in the gravel garden has produced a flower this year. I must do a post on the gravel garden. Planted just over a year ago it has done really well and things are filling out nicely there. But that’s for another day. Off now to catch some evening rays. Dogs and trees and Spring sunshine. When we arise in the morning the first job, after putting the kettle on, is to let the dogs out of their shed. They then come in the house for a while. 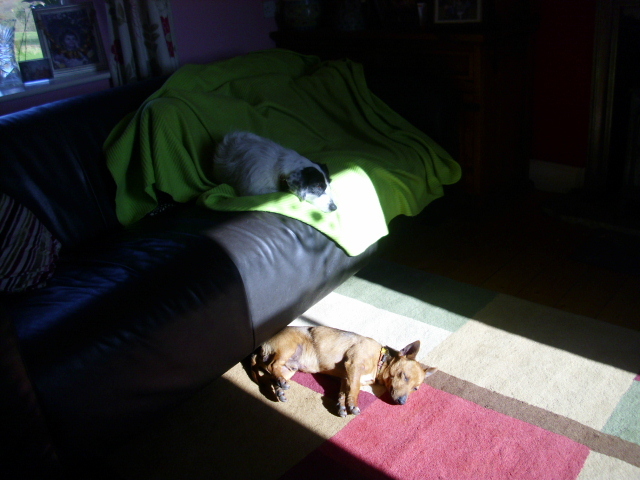 If it’s sunny they like to lie down and catch a few rays in the sitting room where the couch is appropriately situated. In the field the animals do the same thing. How clever they are to avail of this solar energy…actually I think they’re a lot cleverer than most people give them credit for. I’ve also noticed many times that the bulk of their bodies will be facing full on towards the sun to expoit it fully. 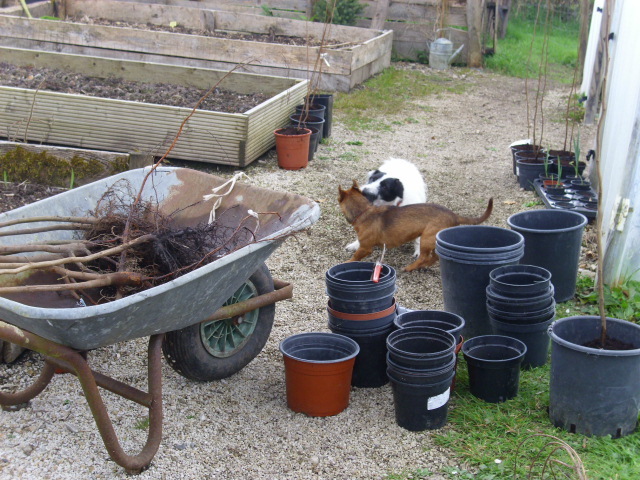 On Sunday we bought 30 bare root trees at the local garden centre. It’s the end of the bare root season now so they were selling them off at half price. They worked out at an average of 80 cent each. Bargain! 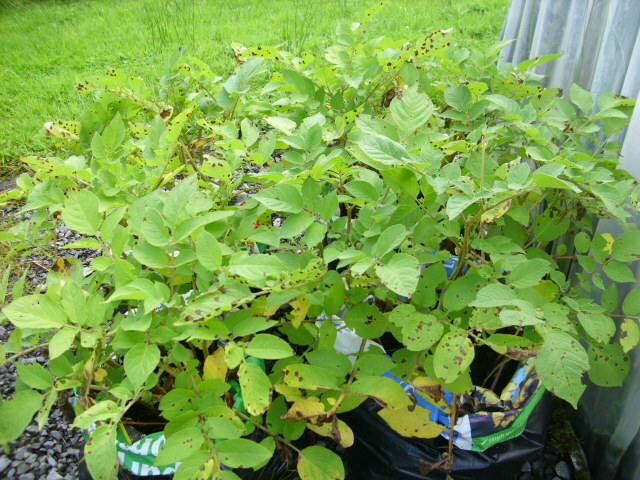 The haul included Birch, Alder, Rowan, Poplar, Larch and Acer. A small forest in the making. 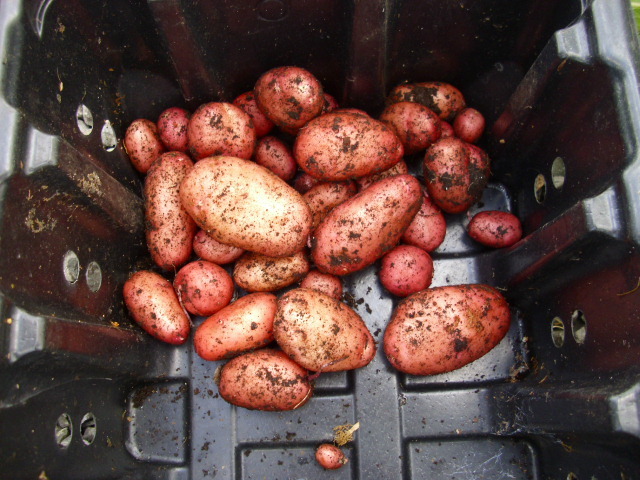 After soaking them overnight we planted them up on Monday morning. Working together the job was done quickly. 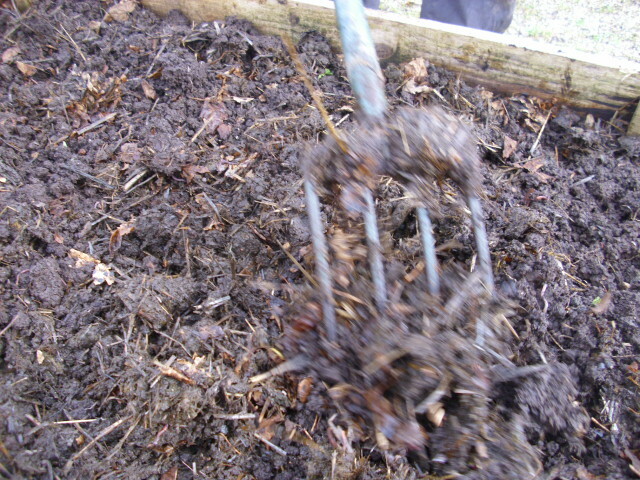 Compost was emptied into the wheelbarrow… Andy held the tree upright in the pot and I backfilled it with compost. Took about an hour to plant the lot. 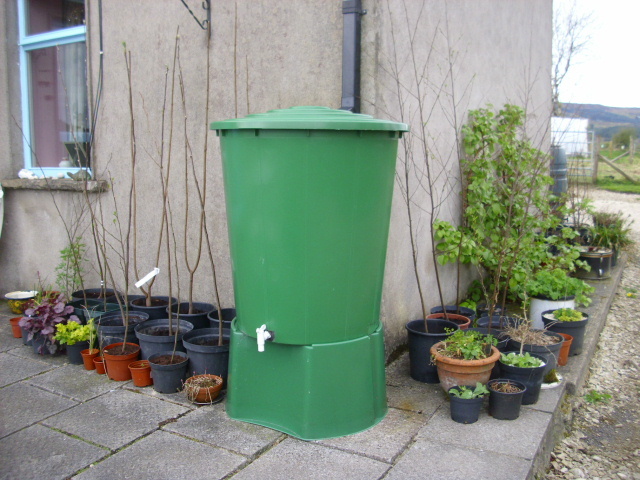 The bigger trees we placed near this rain water barrel which will be convenient for watering throughout the Summer. In Autumn we intend incorporating our small field…below the polytunnels…into the garden…these will then be planted there. The smaller trees are at the other side of the house near another rain barrel. 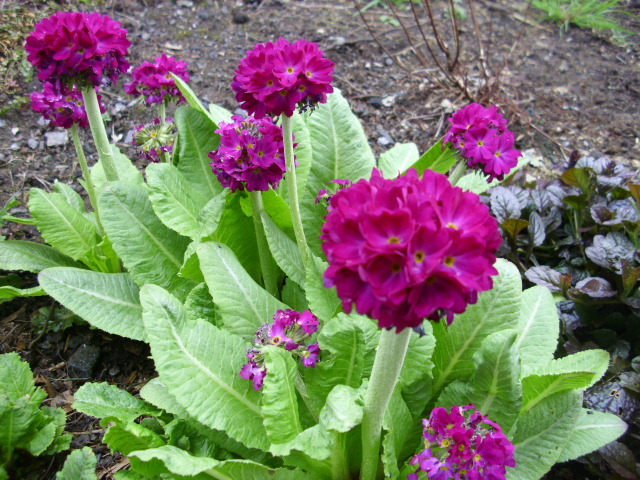 In the shade bed these lovely Primulas have started flowering. I have that to confess that this was one I “slipped” from another garden I visited. Naughty but I will share it on as it bulks up. “Slipping” is a word Irish people…especially older people…use for taking a cutting or an offshoot with roots from a plant. 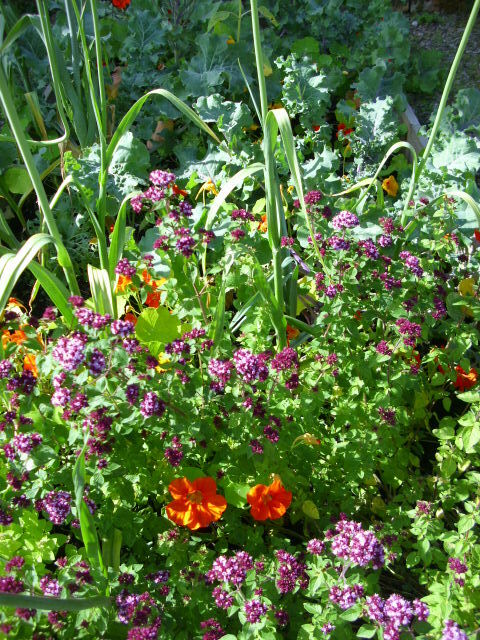 Years ago many people had cottage gardens where all the plants would have been grown from “slips.” Does anyone else know of this phrase? In the polytunnel Parsley and Rocket give lots of green pickings. This is Wild Rocket which has…for me…a nicer flavour than the ordinary Rocket. Parsley and Rocket together make for a really nice pesto which I will make when the current batch of Wild Garlic pesto has run out. Basil is already planted and germinated for the Summer pesto. 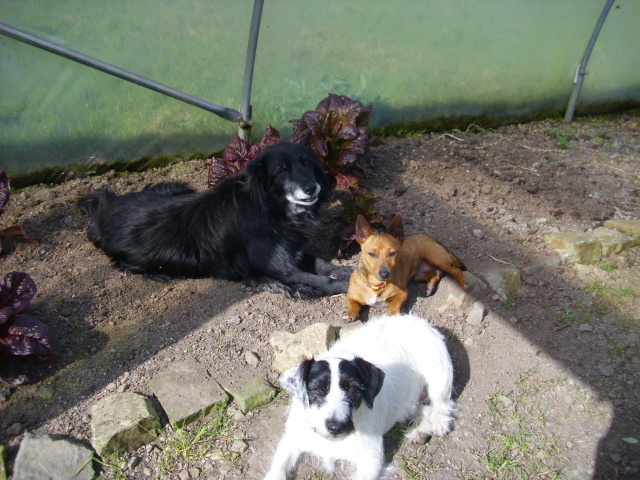 And in the polytunnel the dogs are once again strategically placed to catch the rays of the afternoon sunshine. 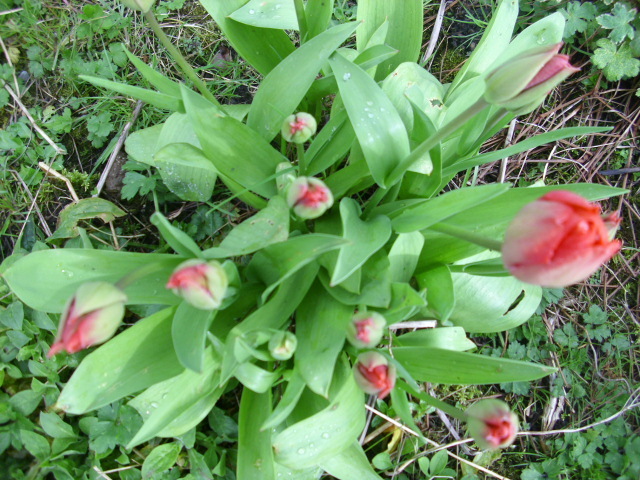 As Spring Equinox approaches we are spending lots of time in the garden. It’s that time of year when the green returns and we are enthused by spending time revelling in it. 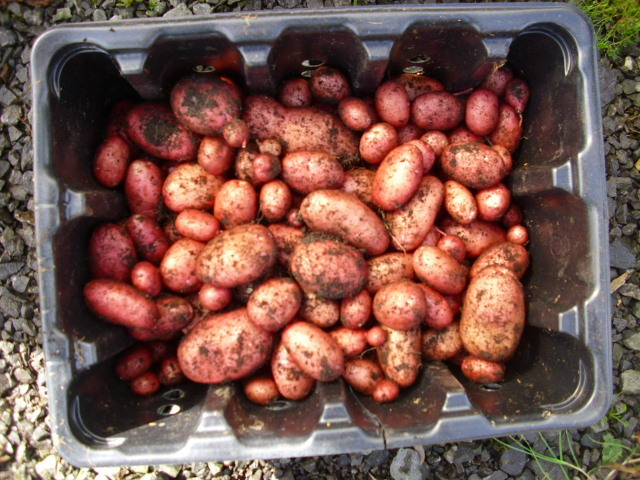 In the polytunnel beds have been dug and manured ready for the plants that are growing in the seed trays. The Peach tree is in full flower. This will need to be hand pollinated as there are few insects about this early. 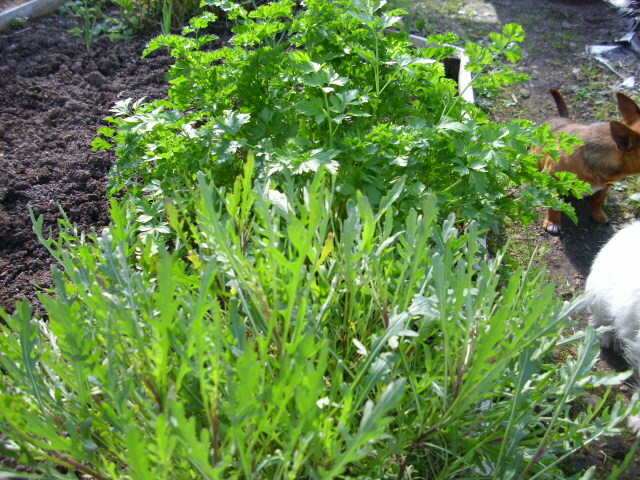 Some seeds are sown direct in the beds: Oriental Salad Mix, Rocket, Spring Onions and Spinach. 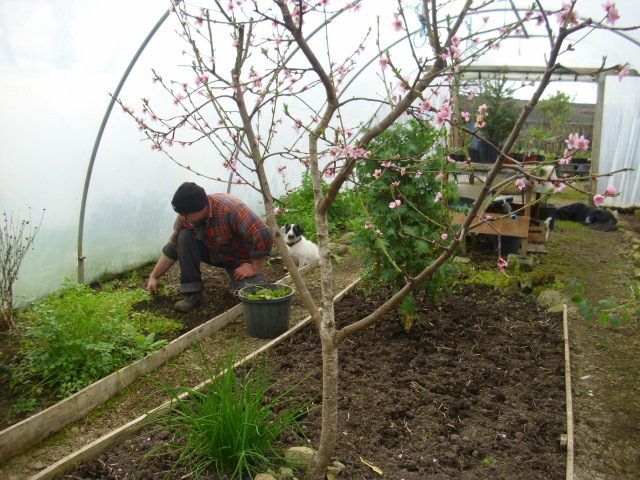 All the manure used in the garden is from our own animals. 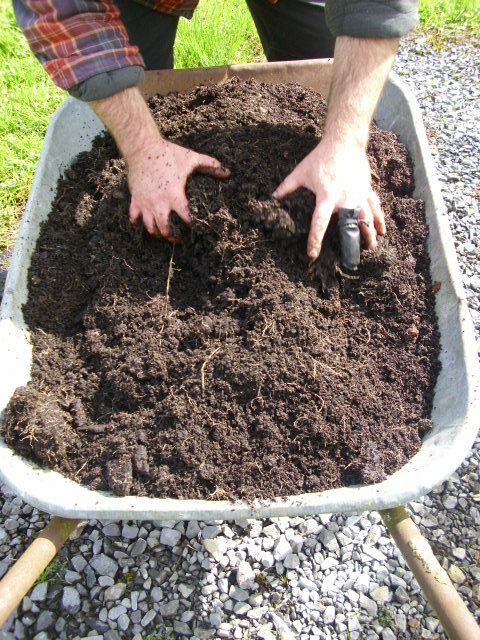 There’s also the compost made from vegetable waste from the garden, vegetable peelings and teabags from the house. It is full of worms, beautifully dark and crumbly. 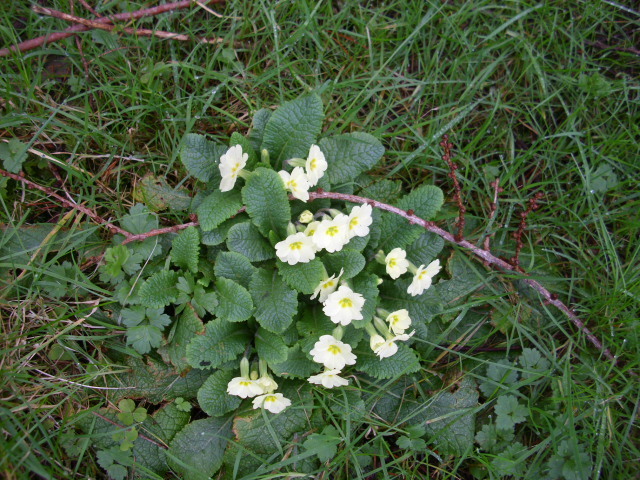 Spring Equinox is a day earlier than usual this year because of the leap year. The Equinox ocurs about 6 hours later each year, with a jump of a day backwards on leap years, hence 20th March this year. The Sun will be rising earlier each day now, 6.o5 tomorrow, and nightfall will be coming later and later. 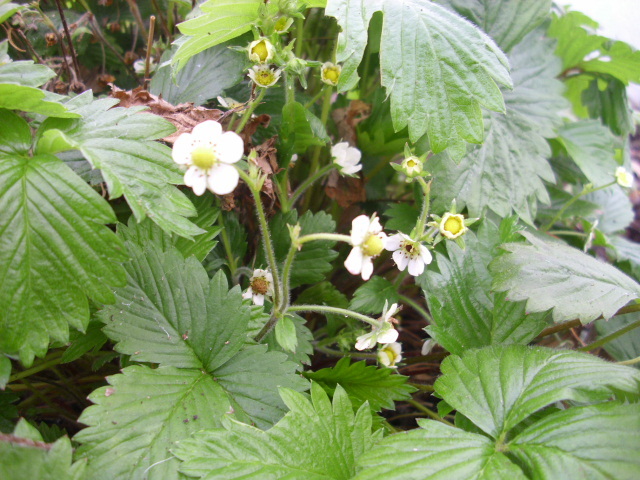 Strawberries are already flowering in the polytunnel, very early this year. This is an alpine variety, small but very sweet fruits. At the Vernal Equinox day and night are of almost equal length. The Sun rises exactly in the east, travels through the sky for 12 hours, then sets exactly in the west. I look forward to the budding trees revealing their beautiful new leaves, the wind becoming less harsh, plants sprouting and everything being seized by the vibrancy of the Spring season. For this is the real beginning of Spring. Everything in nature is being revived, growth really takes off and the Sun is gaining height and strength. A great festival of awakening. Happy days to all. May you and yours revel in the joy and beauty of it all.